Identify the amine, amide, and thiol functional groups. There are some common—and important—functional groups that contain elements other than oxygen. In this section, we will consider three of them. Naming simple amines is straightforward: name the R groups as substituents and then add the suffix –amine, using numerical suffixes on the substituent names as necessary. This amine is diethylamine. This amine has a methyl group, an ethyl group, and a propyl group. Listing the names in alphabetical order, this amine is ethylmethylpropylamine. (For more information on Brønsted-Lowry bases, see Section 12.2 “Brønsted-Lowry Acids and Bases”.) The amine becomes an ion, the organic counterpart of the ammonium (NH4+) ion. Because no amine is presented in Table 12.2 “Strong Acids and Bases,” all amines are weak bases. The weakness of amines is about the same as that of carboxylic acids. N-containing organic compounds are very common in nature, and they all act as weak bases. Some of these compounds have rather complicated structures. Figure 16.5 “Some Naturally Occurring N-Containing Compounds” shows some N-containing substances that you may recognize. The bond between the N of the amine group and the C of the carbonyl group is called an amide bond. Amide bonds are particularly important in biological molecules called proteins, which are composed of strings of amino acids—molecules that have an amine group and a carboxylic acid group in them. The amine group on one amino acid reacts with the carboxylic acid group of another amino acid, making a chain held together by amide bonds. We will consider proteins later in this chapter. Draw the structure of the amide formed by the combination of ethylamine and butanoic acid. Draw the structure of the amide formed by the combination of methylamine and formic acid. 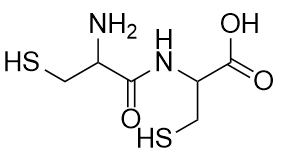 where the R group is the rest of the cysteine molecule. The disulfide bond is strong enough to fix the position of the two cysteine groups, thus imposing a structure on the protein. Hair is composed of about 5% cysteine, and the breaking and remaking of disulfide bonds between cysteine units is the primary mechanism behind straightening and curling hair (hair “perms”). The description of cysteine mentioned that it is an amino acid. Amino acids are the fundamental building blocks of proteins, a major biological component. Proteins are a necessary part of the diet; meat, eggs, and certain vegetables such as beans and soy are good sources of protein and amino acids. All life on earth—from the lowliest single-celled organism to humans to blue whales—relies on proteins for life, so all life on earth is dependent on amino acids. The human body contains 20 different amino acids (curiously, other organisms may have a different number of amino acids). However, not all of them must be obtained from the diet. The body can synthesize 12 amino acids. The other 8 must be obtained from the diet. These 8 amino acids are called the essential amino acids. Daily requirements range from 4 mg per kilogram of body weight for tryptophan to 40 mg per kilogram of body weight for leucine. Infants and children need a greater mass per kg of body weight to support their growing bodies; also, the number of amino acids that are considered essential for infants and children is greater than for adults due to the greater protein synthesis associated with growth. Because of the existence of essential amino acids, a diet that is properly balanced in protein is necessary. Rice and beans, a very popular food dish in Latin cuisines, actually provides all the essential amino acids in one dish; without one component, the dish would be nutritionally incomplete. Corn (maize) is the most-grown grain crop in the world, but an overreliance on it as a primary food source deprives people of lysine and tryptophan, which are two essential amino acids. People on restricted diets—whether out of necessity or by choice (e.g., vegetarians)—may be missing the proper amount of an essential amino acid, so it is important to vary the diet when possible to ensure ingestion of a wide range of protein sources. Other functional groups include amine, amide, and thiol functional groups. What are the structure and name of the smallest amine? What are the structure and name of the smallest thiol? Identify each compound as a primary, secondary, or tertiary amine. Write the chemical reaction between each amine in Exercise 3 and HCl. Write the chemical reaction between each amine in Exercise 4 and HNO3. A peptide is a short chain of amino acids connected by amide bonds. 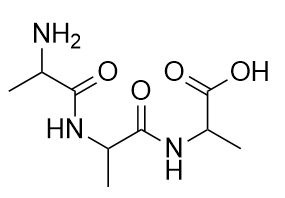 How many amide bonds are present in this peptide? Draw the backbone structure of the amide formed by reacting propylamine with propanoic acid. Draw the backbone structure of the amide formed by reacting hexylamine with ethanoic acid. Name each thiol using the –thiol suffix. Name each thiol in Exercise 13 with the mercaptan label. An S–S bond can be fairly easily broken into proteins, yielding two lone cysteine units in a protein chain. Is this process an oxidation or a reduction? Explain your answer. Other Functional Groups by David W. Ball and Jessie A. Key is licensed under a Creative Commons Attribution-NonCommercial-ShareAlike 4.0 International License, except where otherwise noted.